The Martha’s Vineyard Regional High School girls varsity tennis season came to an end with a 3-2 defeat to unbeaten top seed Cohasset (19-0) Tuesday afternoon in the MIAA Division 3 South Sectional quarterfinals. The Skippers knocked out M.V. in the South semifinals last year. Tuesday’s match was more worthy of a sectional final than a quarterfinal. The teams featured three of the top eight singles players in Southern Massachusetts; the Vineyard’s Samantha Potter and Annie Burton, along with top-ranked Emma Davis of Cohasset. 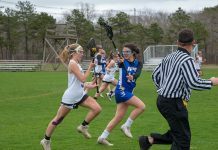 The Vineyarders came into the match bearing a misleading eighth seed, based solely upon an 11-5 regular season record and not on strength of schedule. 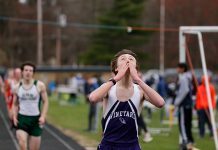 The Vineyarders twice lost to Division 1 Barnstable and once at Cohasset. 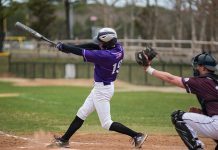 The Purple split season series with strong teams from Bishop Feehan and Ursuline Academy. Emma Davis lived up to her top billing and overpowered Sam Potter at first singles, 6-0, 6-0. Julia Cooper and Josie Iadicicco got the Vineyarders on the board with a 6-2, 6-4 win over Kate Sookiasian and Meredith Spofford at first doubles. Annie Burton got the Vineyarders a second point by defeating Emma Smith, 6-2, 7-5, at second singles. Cohasset’s Sara Corry bested Charlotte Potter, 6-4, 6-1, at third singles, while Brianne Crough and Gabrielle LeMoine won at second doubles over the Vineyard’s Katherine Donegan and Diamond Araujo, 6-4, 6-0.